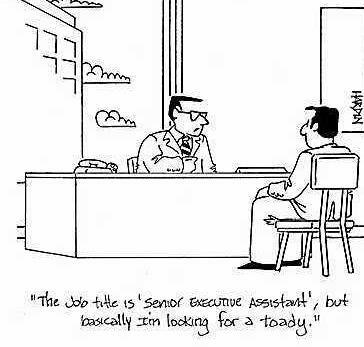 Every job has a specific title whether it is an entry level position or the CEO. So what does each title mean? Does the title give an accurate measure of the value of an employee? Titles are sometimes very good, but at the same time they can be very deceiving. I recently spoke to a friend of mine that we’ll call Brad. He has a specific title within his company. At his company, each employee that starts out in his position has to work their way from step 1 to step 3 where they are then considered for management. Brad has been in his step 2 position for the same length of time and has the same responsibilities as step 3 employees. He also has the same amount of experience on high profile projects as the step 3 employees. Brad also went above and beyond by getting additional education to be more qualified for management. Because of his significant experience, he has been ready for a step 3 promotion for quite some time. He has not, however, received his promotion because his superior has not made it a priority to promote him. Since he has the same level of experience as other step 3 employees, but without the title, he applied for a position in management. On the first position for which he applied, he did not even get an interview. Once the hiring manager saw Brad’s title, he stopped looking at his resume altogether. The hiring manager did not review Brad’s experience or qualifications prior to removing his name from the list of potential candidates. He only saw his title and that was the end of it. At a later time, my friend tried again for a position in management and was able to get an interview. If he were to get the position, he would be skipping step 3. Once he did the interview, he was notified that he did not get the position. In a follow-up interview, he found out that this interview process was very similar to the previous application process. The hiring manager felt Brad was very qualified for the position and that he did very well on the interview. He did infer that due to the regular succession from step 1 to 3 prior to management, Brad was not considered as being as qualified as other employees. At the end of the follow-up interview, the hiring manager mentioned that he felt Brad was indeed ready for the step 3 position and he would see what he could do to get him promoted. The question I have is, do titles mean everything or are employees more valuable than there title? Well, it sounds like “Brad” is definitely ready for a new position. I’d say some are better than their titles, even essential in some companies (though their titles may not reflect it). And some are perhaps of less value than their titles reflect as well. Lindsay, Thank you for your comment. I totally agree with you that Brad should either get promoted soon or get a new position elsewhere. It is quite a challenge because as they say, a bird in the hand is better than two in the bush. He must acquire a new job before he lets his good job go, or he will have bigger problems. The Irony is that, if Brad goes to a different company by showing his job responsibilities, experience, and education …….. then he will definitely get in to Management. Most of the times, companies look their employees as a lesser value as compared to a person coming out side of the company. We all know the famous saying……..”Unknown enemy is way more dangerous than a known one”. But we don’t follow that psychology. Only statistically speaking, more than 60% of the employers are willing to hire external same experienced level candidate for the Management position, instead of a well deserving internal candidate.